Nigeria House of Representatives don tell President Muhammadu Buhari to sack di Inspector-General of Police, Ibrahim Idris. Dem say im no get di 'capacity' to address security challenges for di country, especially di kill-kill by herdsmen for Benue State. Di House also direct say make di Police IG apologise to di Governor of Benue State, Samuel Ortom, after di Force Public Relations Officer, Jimoh Moshood, call di governor "drowning man" for one TV programme. "We dey call on di president to replace di IGP with officer wey dey more professional," na wetin di House stamp for paper. Before dem stamp am, di speaker of di House of Reps. Yakubu Dogara, say: "If we pass dis amendment, e mean say di entire House don pass vote of no confidence on di IGP", na im members say "yes". 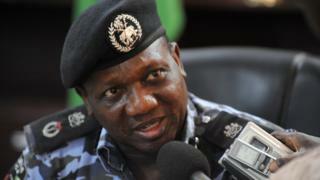 Di lawmakers also descibe di talk-talk person of police; Moshood as officer wey no dey fit to remain for police force.